In the days of reconstruction after the Civil War, a wild strip of land in northern Louisiana remained unconquered by troops and untamed by the law. This is the story of the fearless veterans--Union and Confederate--who dared to enter this beautiful but hellish valley. . .and finish what the war started. Red River Valley, 1869. Hoardes of ex-Confederate soldiers have emerged from the piney hills and mosquito infested swamps of Lousiana backcountry in a final, bloody show of defiance. After a series of violent raids on carpetbaggers, freed slaves, and northern cargo ships, Captain Douglas Owens of the 4th Calvary is given orders to reclaim this God-forsaken land from its murderous outlaw gangs. By Owens' side is Huff, a former slave, and Basil Dubose, an ex-Rebel gunslinger for hire who answers to no man but his paymaster. With each deadly encounter, it becomes clear to Owens that neither the Army nor the public is willing to spill blood for the sake of freed slaves. With his options dwindling, the Captain takes a squad of soldiers under his command--in a last desperate bid for freedom and justice that would change the course of history. 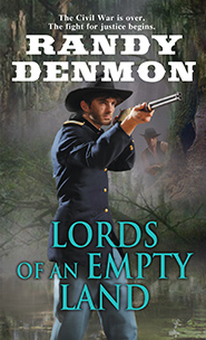 . .
Long a western enthusiast, Lords of an Empty Land is Randy Denmon’s third novel. His first novel, The Lawless Frontier, was a finalist for the Western Writers of America Spur Award. True West magazine has cited Randy as a writer who takes the reader to “places rarely visited by the average western writer,” and American Cowboy magazine has called him a “promising new voice” in the genre. Randy has a fourth western novel scheduled for publication in 2015, also with Kensington. Randy was born, raised, and still resides in Louisiana. A Gulf War veteran, he is a practicing civil engineer when not writing.